Come and learn how to make Origami cranes! Family Friendly. Free entry. Folding paper cranes is done in memory of all those killed by the Hiroshima and Nagasaki bombs because of the story of Sadako, a Japanese girl who was just two years old, living in Hiroshima when the atom bomb was dropped. Sadako later developed leukemia and while in hospital heard the legend that anyone who folded 1000 paper cranes would have their wish granted. Wishing for peace Sadako set out to fold One Thousand Paper Cranes before she died aged 12. A statue of Sadako holding a golden crane stands in the Hiroshima Peace Memorial Park. This huge number represents all the people killed by the devastating Hiroshima atomic bomb in 1945 (that year alone). Note that Cranes workshops are normally held on the second Saturday of every month at the Peace & Justice Centre but this month will be at the Festival of Resistance in the Meadows. Second Saturday of every month: 2:00pm – 4:00pm at the Edinburgh Peace and Justice Centre, 5 Upper Bow, Edinburgh EH1 2JN. It’s a good idea to check with us to make sure a workshop is happening on any given Saturday because the workshops are run by volunteers. . VOLUNTEERS Needed. 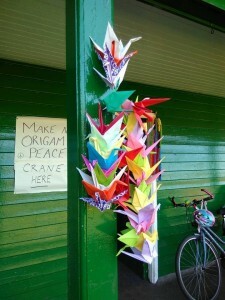 If you like doing crafts and chatting with people and want to do something for peace why organise a workshop in your local community centre, library or school, or organise a local group to make 1,000 cranes to contribute to the project? Contact the centre on 0131 629 1058 to confirm workshops are happening or to volunteer.